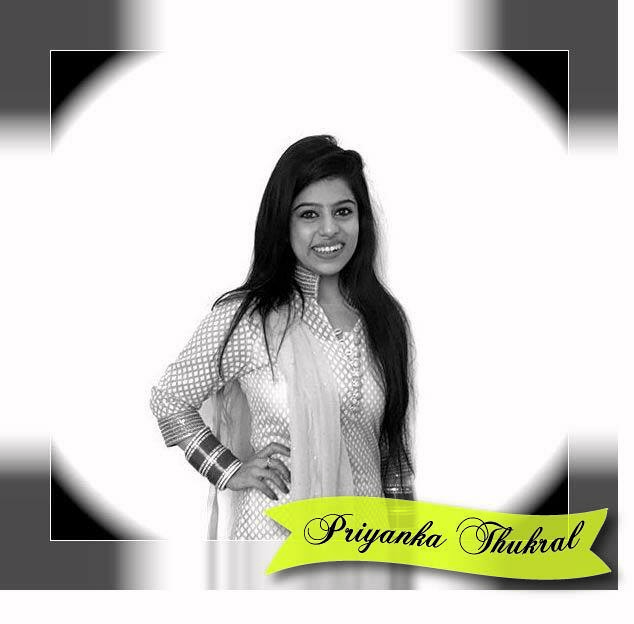 Meet Priyanka, she is 26 years old, Marketer by profession & a Crafter/Artist by passion. Since her childhood, she has been always fascinated by colours and crafts. She always believed in giving handmade card to people instead of rushing to stores. 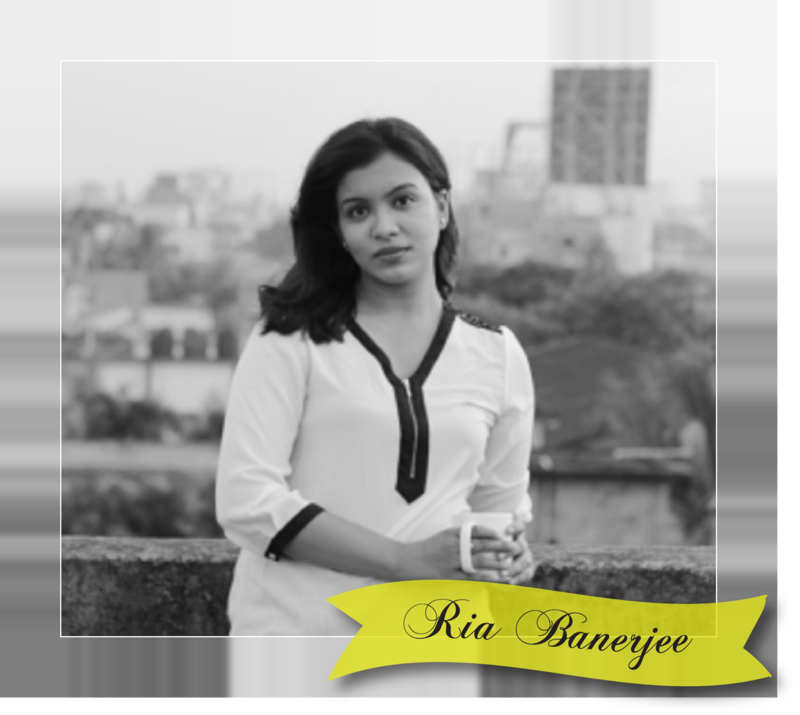 She started with gifting unique handmade gifts to her friends and her aim is to spread happiness. You will see her coming up with new and unique gifting ideas. 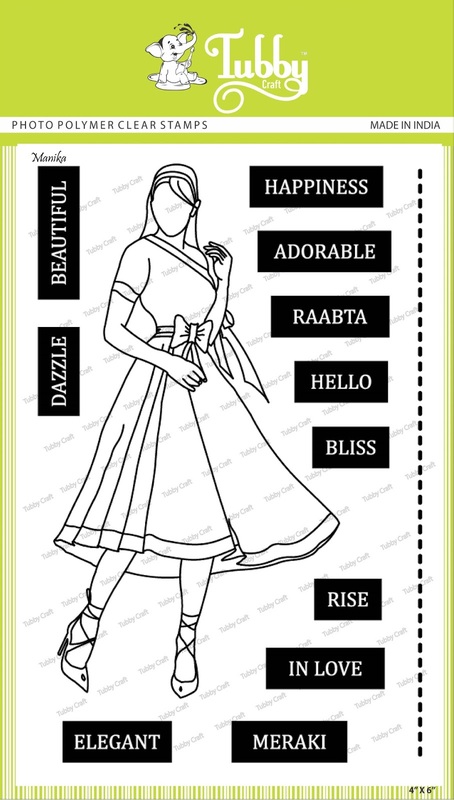 We are sure her creations will bring smile to your face. Today she has two amazing projects to show. Over to you.. 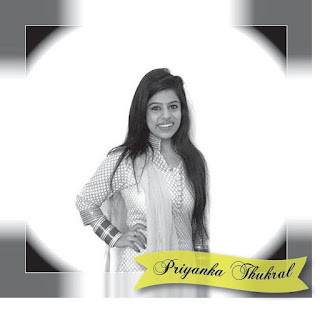 It's Priyanka here today and I'm absolutely elated to be a part of the Tubby Craft Design Team. I am a Marketer by the day & crafter by night. 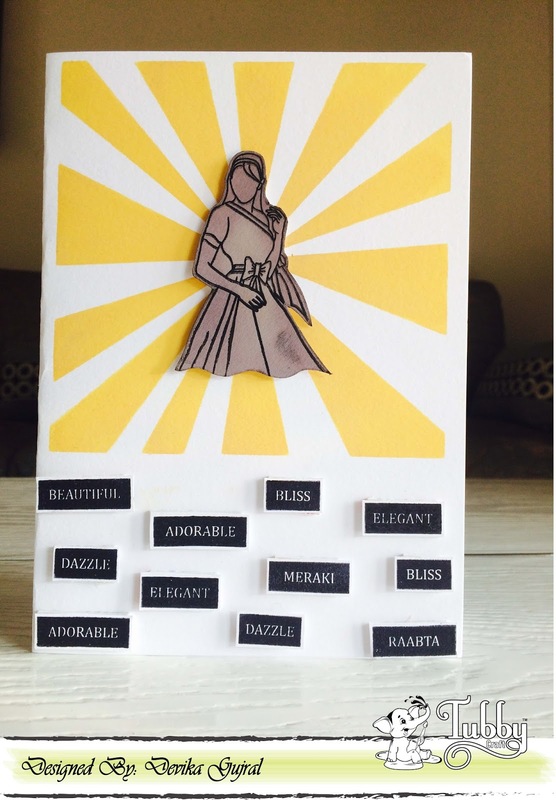 I started Happily For You with a simple aim to make a difference in someone's life & spreading happiness in a way that has a far more impact & what better than something personalised, something they see a reflection of their own in a very unique and creative way. 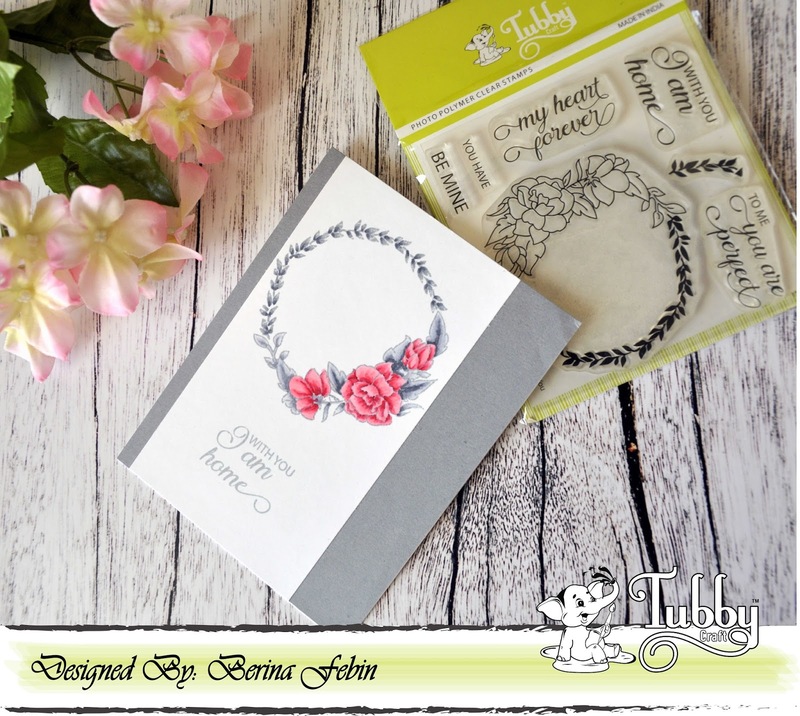 Today, I've 2 projects using Tubby Craft stamp sets. I had my eyes set on this stamp from the very moment I saw this and I knew I had to make something using this. With Valentine's day almost here, it couldn't have been a better way to start the journey. I started with stamping the giraffes and the board stamps on the white cardstock. Next I coloured these using my Duo colour pencils and fussy cut them. 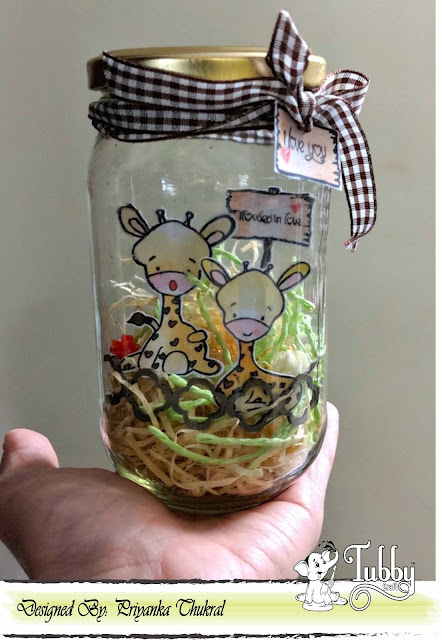 I then took the paper grass in light brown & green, crumbled it & added it inside the jar. Next I added the chipboard to one side of the jar to give it a look of the fence. 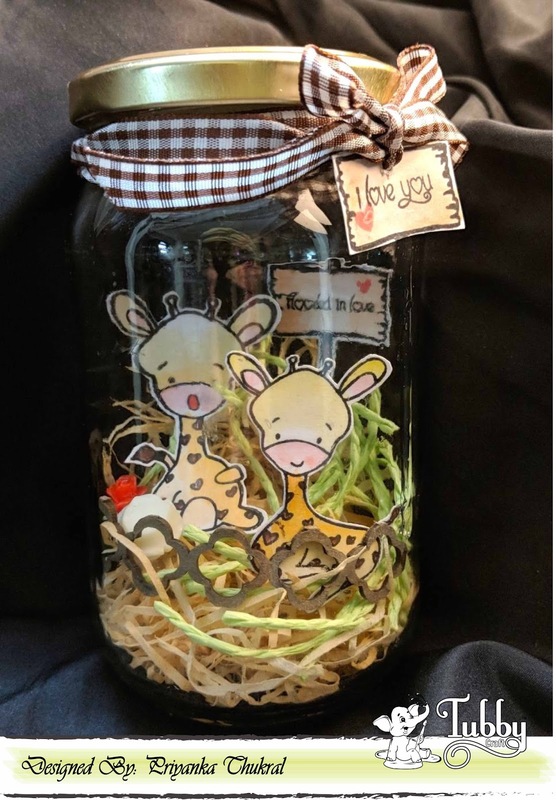 Then I added the fussy cut giraffes & the board with the sentiment "Flooded in Love" on it to the jar. and scattered a few resin roses inside it. Next after closing the lid I wrapped a brown ghingam ribbon around it & added the sentiment "I love you" to it. TADA!! 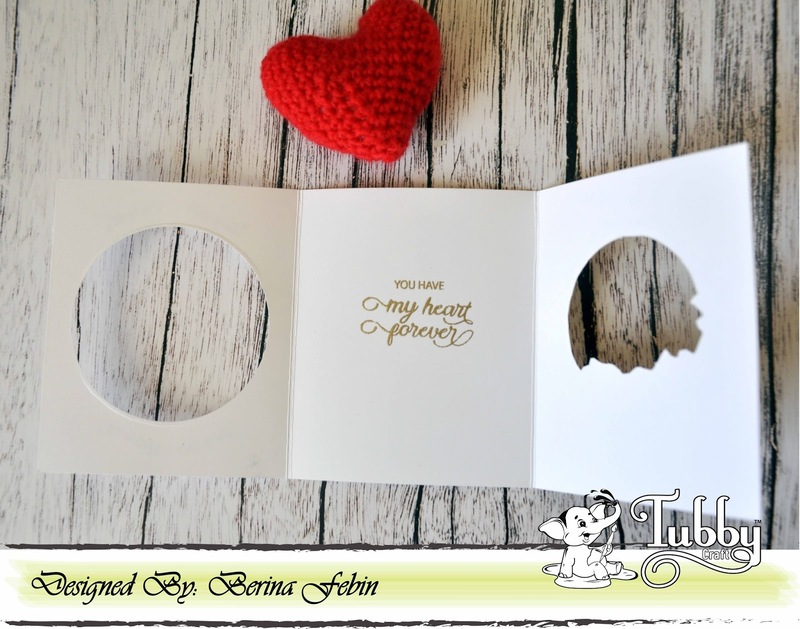 the valentine's love jar is ready..
For this card I have used the wreath and sentiment stamp from the Perfect You stamp set. I started with taking a white cardstock and scored it in the center and folded it. Then I took the wreath stamp & inked it with different coloured distress inks for the leaves and flowers and stamped it in the center of the card. Then using distress ink I coloured the flowers and leaves. Then using a black coloured pen I defined the edges of the wreath and its elements. and added the stiched lines to the corners of the card stock. Next using my black ink I stamped the sentiment "To me you are perfect" in the center of the wreath. Later I coloured the center of the wreath with the blue coloured distress ink. and here, the card is all ready.. !! Hope you liked both the projects. Do let us know your thoughts on these. Wishing you all Happy Republic Day. Hope peace reigns in your part of the world today and everyday. Today she has two gorgeous cards to share with us. 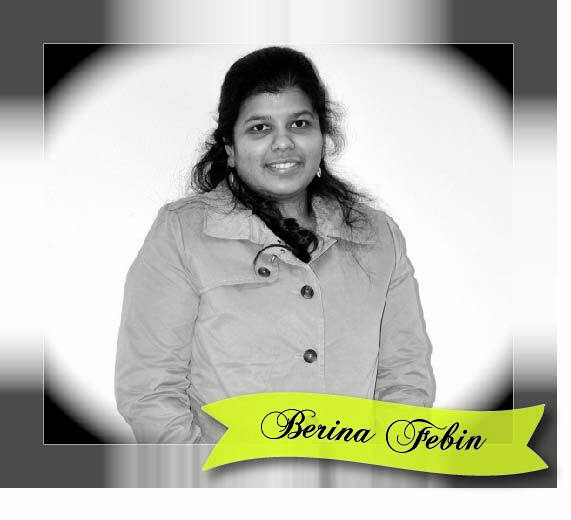 Lets hear it from Berina..
Hello everyone! 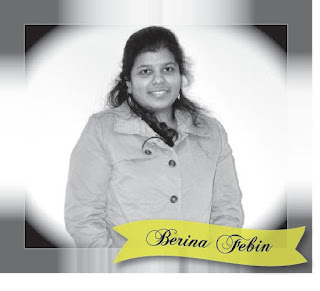 It's Berina here today and I'm so excited to be a part of the Tubby Craft Design Team. 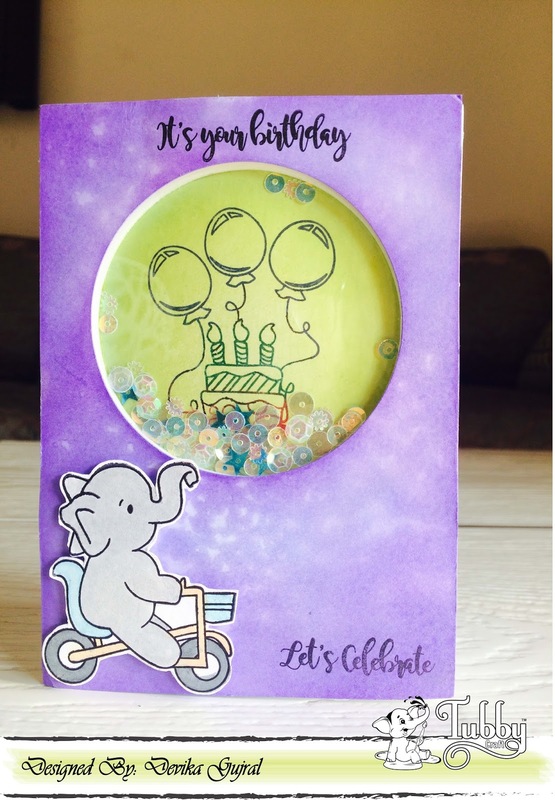 Today, I've made 2 cards using the Tubby Craft Perfect You stamp set. 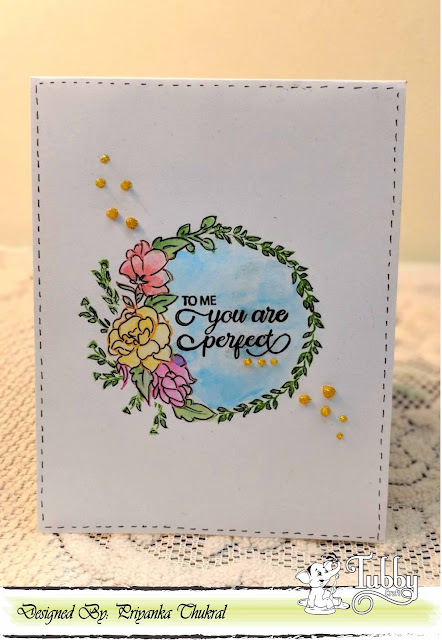 I love this wreath from the Perfect You stamp set. I decided to do no-line coloring on it with a soft and subtle color scheme. Stamp the wreath and the sentiment on white card stock with grey ink and trim the panel to 3" x 5 1/2"
Color the image. This step is my favorite! I used Copic markers to color them. The colors I used are - RV29, RV14, RV13 and RV21 for the flowers and C7, C5, C3 and C1 for the leaves. I also added shading to the tiny leaves. Adhere this panel on to a grey card stock panel of size 4 1/4" x 5 1/2". Then adhere the grey panel on to an A2 card base. This is a tri-fold card with lots of gold embossing. I made this card using a 4 1/4" x 10 1/2" card stock panel (slightly smaller than 4 1/4" x 11", the standard A2 card base size). This picture shows the card with the first fold open. This is the inside of the card, with both folds open, where I have stamped the sentiment. 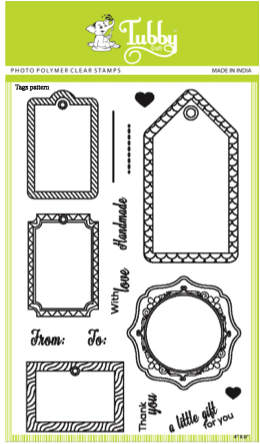 Take a card stock panel of size 4 1/4" x 10 1/2" and score it at 3 1/2" and 7". This makes the tri-fold card base. Starting with the outer most fold, die cut a circle on it. The size of the circle is just a bit larger than the wreath image. Stamp the tiny branches with embossing ink and heat emboss it with gold embossing powder. On the second fold, trace the circle die cut position with a pencil very lightly, to help position the wreath stamp. Stamp the wreath image with embossing ink and heat emboss it with gold embossing powder. Fussy cut the inside of the wreath with a knife. On the inside of the card, stamp and emboss the sentiment with gold embossing powder, so that the sentiment is visible through the hole in the center of the wreath. Color the wreath image on the second fold. I used some inexpensive water-based markers to color this. This tri-fold card kind of looks daunting at first, but is actually pretty easy once you start making it. I hope you liked my cards today. Do let me know your thoughts on them. She is a young and talented artist from Kolkata. She is 25 years old, a teacher by profession, student and also gearing up for the research field. Painting is her hobby from which she got into card making. 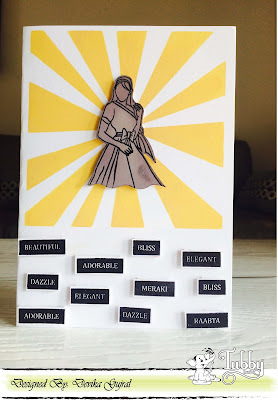 She loves clean and simple designs, which has caught her attention right from the time when she thought of card making. 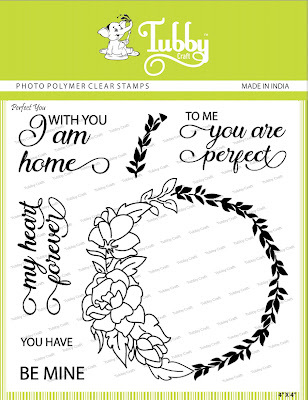 I have stamped the image from Tubby Craft Perfect You stamp set in a die cut piece of cardstock. I have colored the images with Zig clear real brushes. I have added the sentiment from the same stamp set. I have finished the card with a patterned paper on the back and few enamel dots. 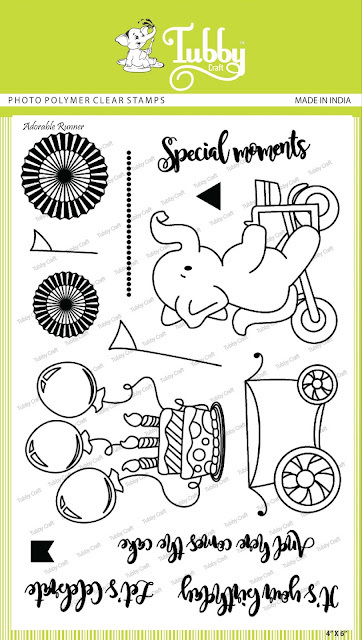 I have stamped the image from Tubby Craft Adorable Runner stamp set and colored it with Zigs. I have die cut the piece of cardstock. I have completed the card with a patterned paper at the back and few enamel dots. I hope you have liked the projects. I am happy to introduce our first design team member - Devika Gujral. She is a self-taught crafter and entrepreneur. 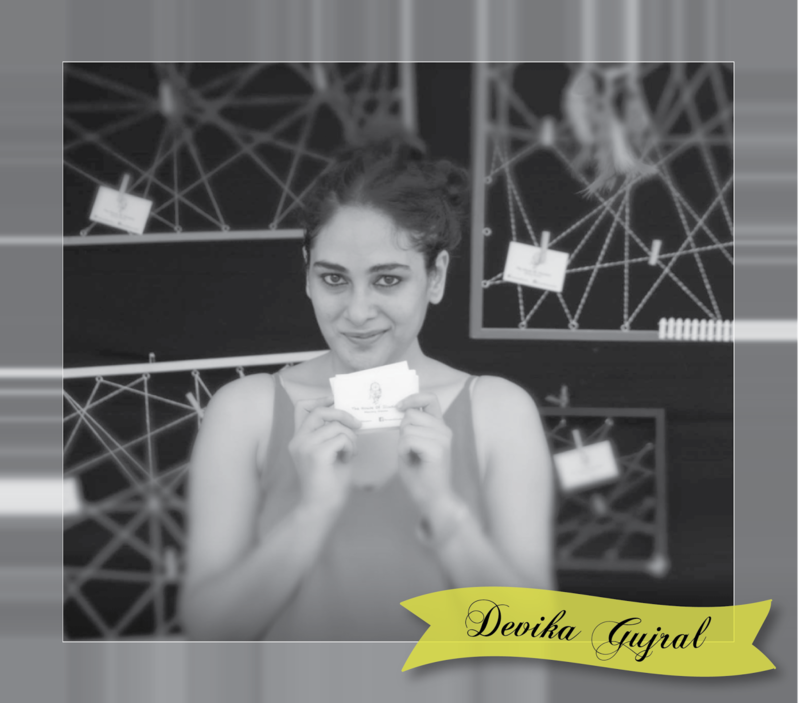 She has her own craft startup, House of Illusion where she personally conducts decoupage, stamping, stencilling and mixed media workshops. Her cute and simple style is reflected in all her designs. 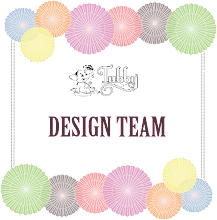 I am Devika and super excited to be part of Tubby Craft Design Team. I have a ravenous appetite for anything crafty. From my house to heart, everything is overflowing with crafty-ness. I like to use stamps, stencils and love to experiment with ink blends on anything that can’t move. I also exhibit my creations at lifestyle exhibitions around the country. In today's post i will be sharing two cards featuring Adorable Runner and Manika stamp set. Let's start with Card 1. Cut out a base on white card stock. 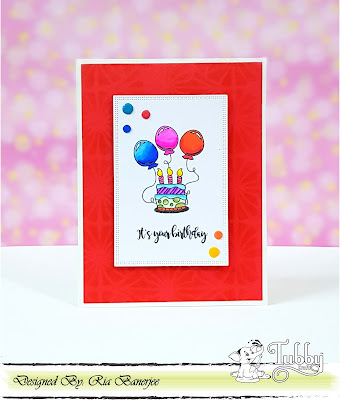 Make a background using distress inks on the white card stock which is used as a base for this card. Stamp the balloon and cake stamp in 3 different coloured inks on the area which will show through the die cut circle. Place the foam adhesive on the base card stock. Fill up the circle die cut area with sequins/sprinkles. Seal it by placing the die cut acetate sheet on top of it. Use distress ink at the uppermost layer of the card and sprint a title bit of water to give it a 3D and bleached look. Mount this layer on top of the layer with the acetate sheet. Foam mount the fussy cut coloured images from the Adorable Runner Stamp Set and stamp the sentiments on the card. I absolutely loved the sentiments as they can be used for any occasion. 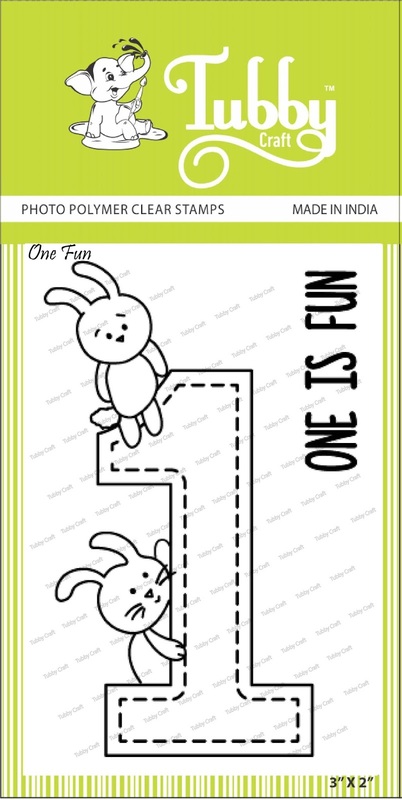 Hence this stamp set can be used for multiple occasions. Make the background by applying some distress ink through the stencil. Stamp the lady stamp and the sentiments from the stamp set on white card stock and fussy cut them. 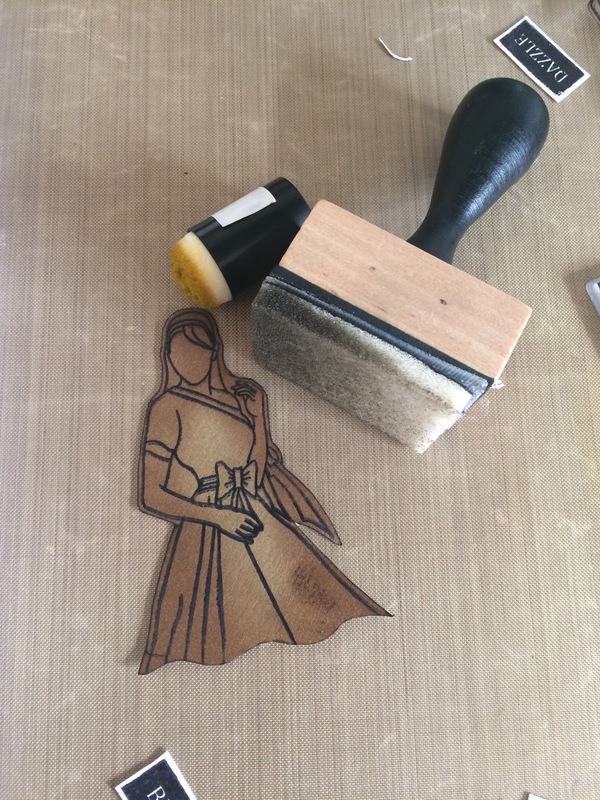 Colour the Lady stamp with distress inks. Foam mount all the cut outs on the base card. You now have a pretty card to gift a girl. That's it for today. I hope you too loved the stamps just like i do. 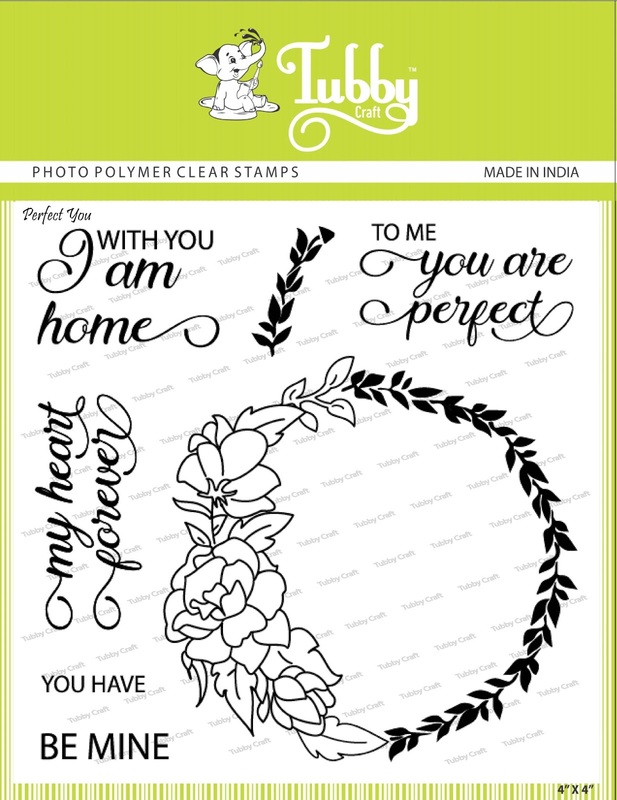 This is Ujjwal and i am so excited to be trying out the wonderful stamps from Tubby Craft. 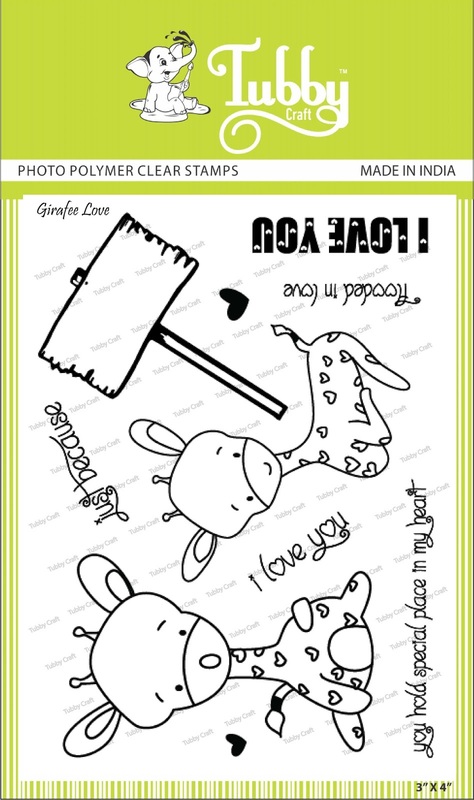 I chose this wonderful “Tag Pattern” stamp set to work with today and had a great time creating with it. 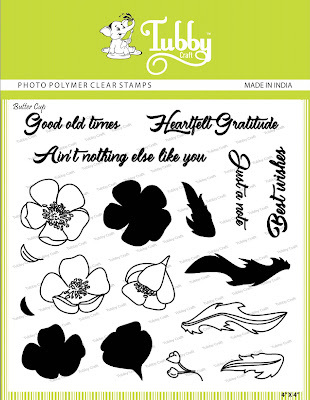 The stamps are of good quality and even the tiniest details stamp perfectly. 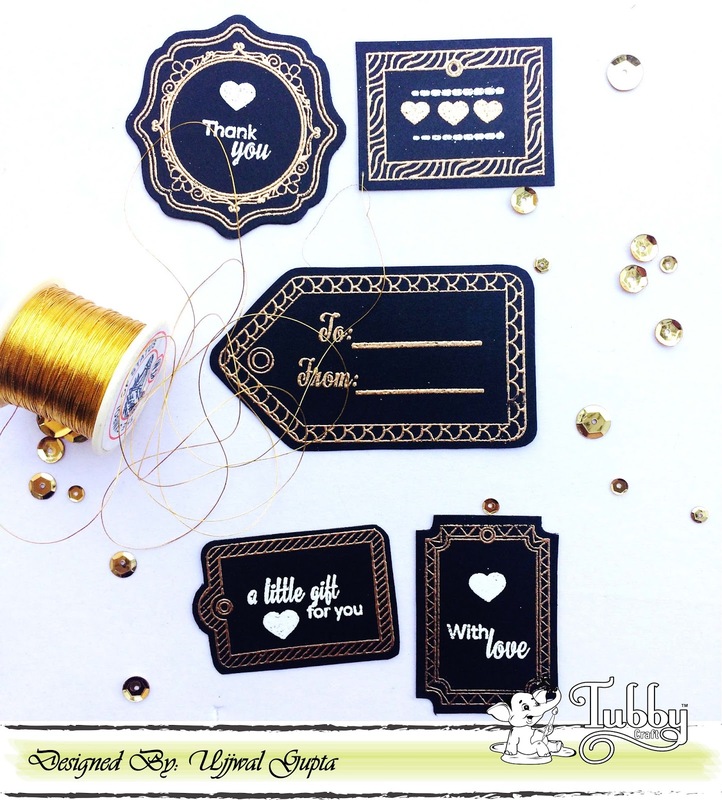 To start with, I created these cute and yet sophisticated tags in black and gold. I used Versamark ink to stamp and Ranger’s gold embossing powder to heat emboss the images. I love the black and gold pop up on the black cardstock. 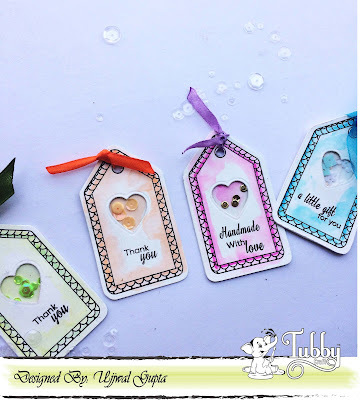 These little tags would be so sweet to add to gifts and make the packaging look great. Next I tried a different technique for the tags and die-cut a heart in the center, filled it with some sequins and added some loose water-coloring. I love that they are so simple and colorful and super easy to make too. And last but not the least, I used the stamp to create a card. 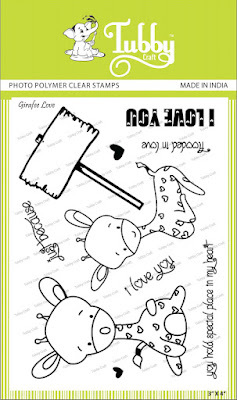 Even though, these are tag stamps, there’s no reason we can’t create a card with it. I stamped the tags with black archival ink on watercolor paper and then added some loose watercolors. A little splatter of black watercolor and the simple stamped sentiment and the card is ready. I hope you liked this projects and will give these stamps a try! 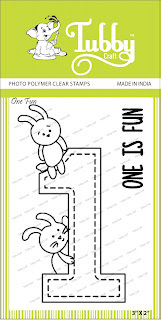 We can not hold our happiness to launch the next set of photopolymer stamps with new and unique designs. Stepping into the year 2018, we have amazing stamps for the month of January and more products lined up for upcoming months. Let's start with our crafty journey of 2018. 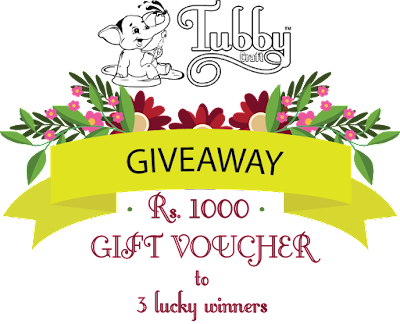 Share your creations with Tubby craft products and get a chance to be a featured on our Instagram and Facebook page. Don’t forget to leave some love on this post. Stay tuned for exciting offers and giveaway.